Adelaide United host West Torrens Birkalla in Round 10 of the PlayStation 4 National Premier League at The Parks Football Centre on Saturday. Following their win over Croydon Kings last weekend, Adelaide United rise up to eight place on the league standings, while West Torrens Birkalla sit a point behind the Reds, in ninth position. In fine form as of late, Huss Skenderovic’s side will be looking to further their undefeated streak to five games, as well as take all three points this coming weekend. Last match day was a success for United, taking ownership of Polonia Reserve in Round 9, with a 2-1 triumph over the Kings, courtesy of a penalty executed by Ryan Strain, and a 52nd minute goal by Jordan Maricic to take the lead once again, and the three points. 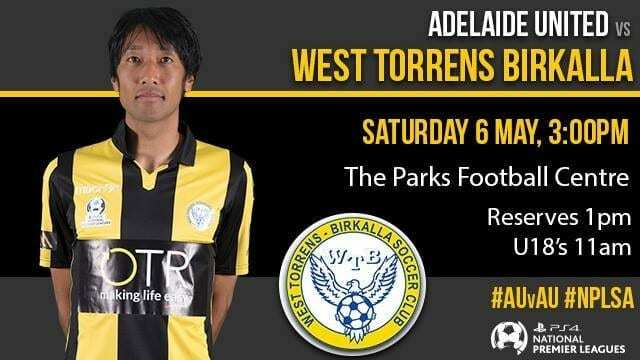 West Torrens Birkalla got their much-needed win over Para Hills Knights at Jack Smith Park, with Fumiya Suzuki scoring the one and only goal of the match. Adelaide United Head Coach, Huss Skenderovic, was pleased with the win last week, as Croydon Kings have proven that they are a tough side. “Away from home against a top side, and they have made it evident that they are a tough team, and very strong at the back, it was good to get the win,” he said. Skenderovic revealed that confidence remains high amongst the squad, but they need to keep consistent and not become too complacent. “The morale is quite high obviously, when you have been playing well and getting results, it is always a booster of confidence. “But every week is a different challenge for us, we keep that in the players’ minds that there shouldn’t be any complacency, but there has been a lot of improvement in that aspect. “And this week against West Torrens Birkalla, we want to make sure as always, that we put what we have worked on during the week into the game. “To penetrate a bit better, and have a bit more quality on the ball, as well as being structurally solid, which is another part of our development. “The key to it is consistency, and so far it has been fantastic, but you can’t drop off, you need to keep developing and have that mindset. “There is a good competitive nature amongst the team, with several boys wanting to have a go off the bench.